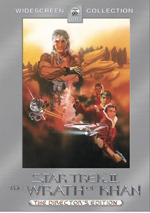 The first cinematic adventure with the crew of Star Trek: The Next Generation, 1994�s Generations stood as an important step in the evolution of Trek. While films that featured the crew from the original series generally did well, would anyone want to see the Next Generation gang on the big screen? At least the original series� group had been off the air more than a decade when they made their first film; the final season of Next Generation ended only about half a year before Generations debuted. To be honest, that's the best reason I can conjure as to why Generations inspires such hearty disapproval, because I find it to be a pretty terrific movie. Some critics took issue with some inconsistent behavior on the part of the characters; they indicate that not all of the participants act in a manner typical for their characters. I don�t see that. I watched all seven seasons of Next Generation within nine months of my most recent screening of Generations, and I thought the characters maintained internal consistency during the feature film. Perhaps I�m just not well acquainted enough with their nuances, but I didn�t detect any uncharacteristic behavior. Another perceived problem - and a more valid one � also affects pretty much every movie that features time travel or a similar concept. Almost inevitably, some oddities will occur and consistency will falter, and Generations is no exception to this rule. To be frank, it's a pretty big example of this rule, all due to the magical presence of "the Nexus," some sort of funky light-ribbon that allows those people inside it to experience their happiest dreams. Old Nexy's a pretty free-spirited ribbon, and he maintains a casual attitude about what folks can or can't do; it looks like anything goes, and Captain Picard (Patrick Stewart) takes advantage of this. It doesn't make a whole lot of sense and will not stand up to scrutiny, but it furthers the plot and creates a more interesting story, so I accept it. Yes, that's a weak defense, but given the inherent faults possessed by time travel stories, it's good enough for me. Despite these concerns, I think Generations kicked off the new series of films with a serious bang. It offers pretty much everything I'd want from a Trek movie: some good action, a compelling plot, and a bit of humor and emotion along the way. Actually, I always found this film to provide one of the more thought-provoking stories of the bunch as it explores the price the Enterprise crew pay for being so devoted to their jobs. Picard seems haunted by his lack of family and through the Nexus, he gets to experience what his ideal home life could have been like. These scenes appear really quite touching as Picard sees what he could have had - in an idealized Nexus way, of course. 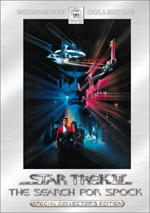 Star Trek: Generations appears in an aspect ratio of 2.35:1 on this single-sided, single-layered DVD; the image has not been enhanced for 16X9 televisions. One of only two Trek films not to boast anamorphic transfers on DVD, the picture badly suffered from that fact. A very mixed bag, parts of Generations looked quite good. Sharpness mostly seemed positive. Some wide shots came across as slightly soft, but most of the movie demonstrated reasonably solid clarity and accuracy. Unfortunately, the image fell apart due to other concerns. Jagged edges became a serious problem, and I also noticed lots of moir� effects. Pretty much anything that could shimmer did so; even Data�s face displayed that issue. Some moderate edge enhancement occurred as well, though it didn�t seem as prominent as I expected. Haloes mostly marred the shots on the planet surface that featured Soran and Picard. Speaking of which, those bright daylight scenes offered some of the film�s least attractive, which was counterintuitive. Normally this sort of external image looks terrific, whereas interiors suffer. In Generations, the opposite was true, as the planet segments seemed too dense and oversaturated. Overall, however, colors tended to look fairly natural and distinct. Red lighting seemed a bit heavy and runny, but the remaining tones demonstrated nice clarity and vividness. Black levels came across as deep and tight, but shadow detail was somewhat too heavy. The low-light shots occasionally demonstrated too much opacity, though mostly they worked fine. Print flaws caused few concerns. I noticed the occasional speckle, but otherwise the movie looked clean. A mix of good and bad, Star Trek: Generations fell to a �C� because the picture largely looked unstable and edgy. The movie badly needs an anamorphic remastering. Happily, the Dolby Digital 5.1 soundtrack of Star Trek: Generations provided a much more positive affair. The soundfield offered the vivid and involving experience I expected. Within the forward channels, the elements moved smoothly across the front and blended together well. The mix showed a good sense of environment and also kicked to life nicely during the action sequences. The surrounds added a fine sense of dimensionality to the package, and they also featured solid individual material during the action pieces. Split-surround usage seemed especially compelling during the Klingon battle. Audio quality also appeared fine. Speech seemed natural and distinct, and I noticed no issues related to intelligibility of edginess. Music presented good fidelity and range and presented bright and vivid tones. A few effects elements sounded a little distorted, and that part of the track came across as a little �hot� at times. However, the effects generally seemed clear and accurate, and they demonstrated tight and rich bass for the most part. In the end, the audio of Generations earned a solid �B+�. Unfortunately, the DVD of Generations merits a well-deserved �F� for supplements. The package includes absolutely no extras � not even a trailer. Eventually Paramount will issue a special edition version of Generations, but for now, this featureless set is all we get. Many others feel differently, but I really like Star Trek: Generations. It provides a thoughtful and lively tale that manifests greater depth than the average space opera. While the DVD features very good audio, it presents a messy picture along with absolutely no features. 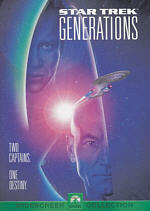 Paramount�s special edition of Generations should come out in 2004. Since it will undoubtedly improve this DVD�s two major concerns � poor picture and no extras � I recommend that fans wait for that release to get the film.